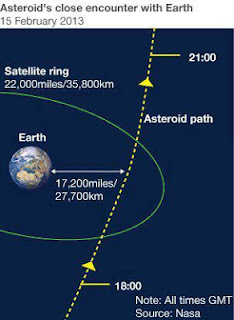 A massive 130,000-ton asteroid is set to hurtle past the Earth on Friday, veering closer to the planet than any known object of its size. The event falls on the same day that a meteorite wreaked havoc when it exploded over Russia's Urals region. NASA is keeping a watchful eye on the 50-meter-wide asteroid – dubbed DA14 – which will sail 17,500 miles above the Earth on Friday at 19:25 GMT. Over half the size of a football gridiron in diameter, scientists said it has no chance of crashing into the Earth, or any of the satellites orbiting our planet. 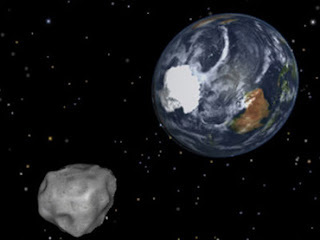 An artist's rendition of the nearest approach of asteroid 2012 DA14 to Earth is shown in this NASA handout still frame from an animated video obtained by Reuters February 8, 2013. (AFP Photo / NASA)DA14 will not be perceptible to the naked eye, though it will be visible from Asia, Eastern Europe and Australia with the aid of binoculars.